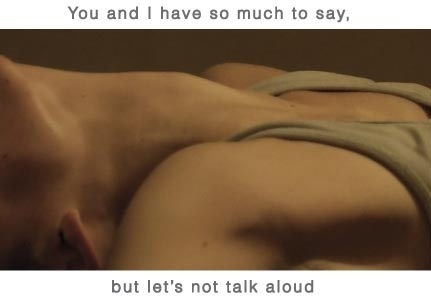 You and I have so much to say, but let's not talk aloud is an unconventional exploration of the individual that minimises the visual frame with extreme close-ups. The intimate collages of facial features and body parts become deconstructed video portraits that are often paired with voice-over monologues or abstract audio based on characters from my short stories and prose poetry. In Character Portraits #1 and #2, the monologues are explicitly about the other character, so the viewer is invited to experience the story as he or she chooses; it is entirely up to the viewer which monologue to view and/or listen to first. This piece can only be heard through headphones, whereas the monitor with abstract visuals (physically separating the two characters) projects abstract audio aloud. Character Portrait #3 explores the body in movement, carefully studying the bone, muscle, and sinew of a dancer as she stretches and carries out her routine. This is the only piece that is silent, as narrative or sound is not pertinent to the image – I am urging the viewer to exclusively focus on what he or she is seeing. I include a self portrait in this show that is also filmed in extreme close-up, however, I deliberately render the entire video out of focus. I encourage viewers to question what they see before them: lips? A nose? A male? A female? While it is a self-portrait, I leave the piece untitled in the gallery space to maintain ambiguity. The only element which hints at gender and identity is a double voice-over. I recite a prose poem in both English and Russian, one version layered on top of the other to further abstract the piece.